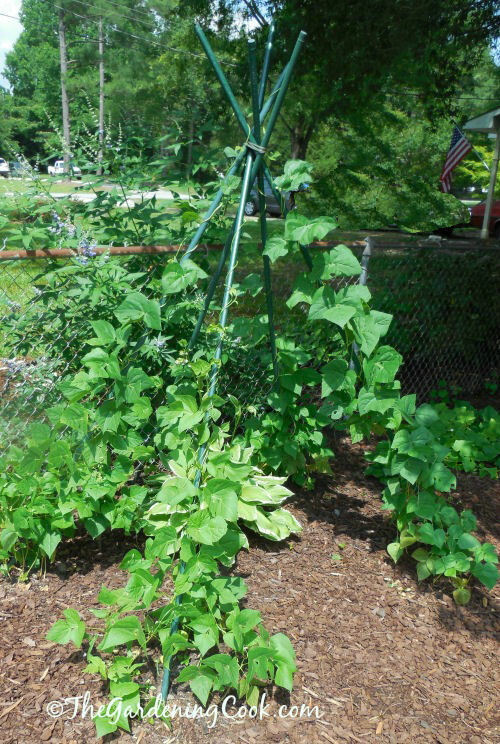 DIY Bean Teepee is both functional and decorative in a vegetable garden. This year, I changed my vegetable garden into a combined perennial/vegetable border. It’s a long story but basically, the squirrels got the better of my veggies last year and I swore never again. Since I will have flowers and vegetables growing in one space, I wanted some decorative and functional items in it. 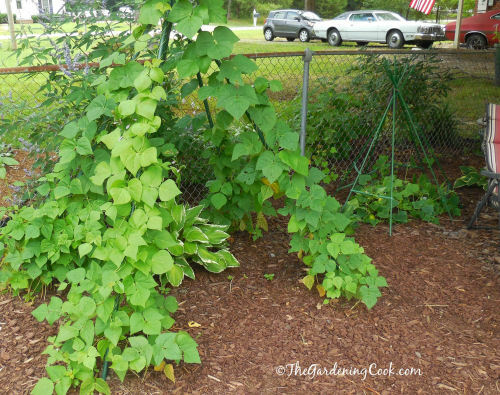 This DIY Bean Teepee looks great and gives great support to climbing beans. The garden is huge – about 1100 square feet and I’ve transformed it with walkways, arbors, paths, and all manner of flowers. Also growing in it are my favorite veggies: tomatoes, spring onions, lettuce, broccoli, bush beans, cucumbers and pole beans. The pole beans are heirloom seeds from my great grandmother’s garden from the late 1800s which have been painstakingly saved from the beans in each generation of gardeners. 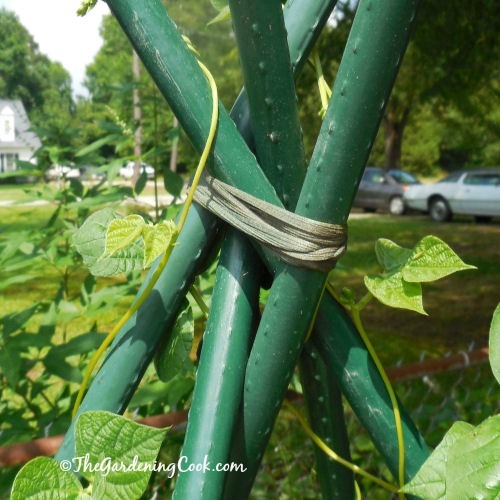 This type of support works best with pole beans and other climbing string beans. 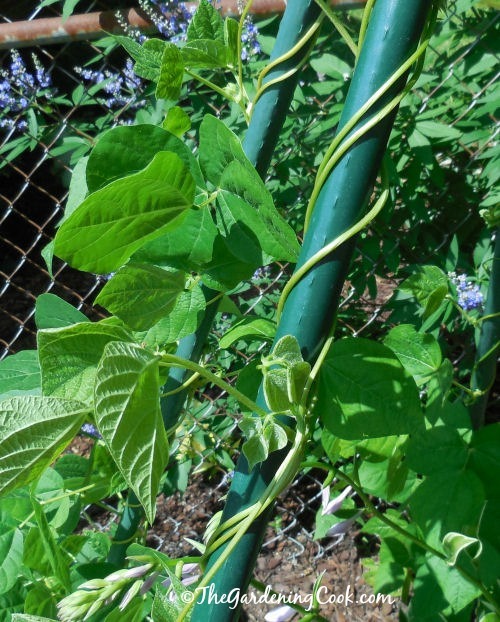 Bush beans don’t need as much support. 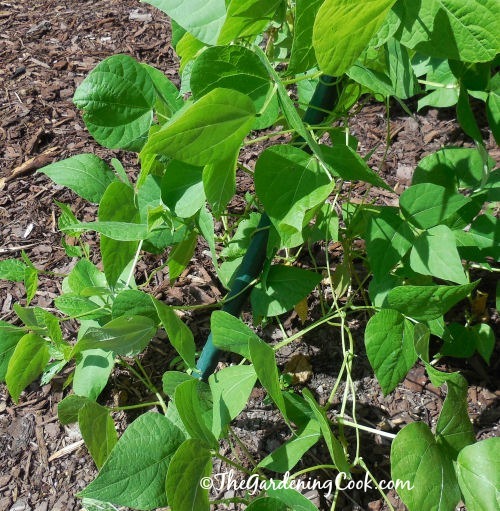 If you are wondering about the differences between pole beans vs bush beans, check out my article on growing beans. It gives lots of great growing tips for both types of beans. I needed something for the beans to climb this year, as well as a decorative accent in my new combined bed that would not look too “vegetably” if you know what I mean. 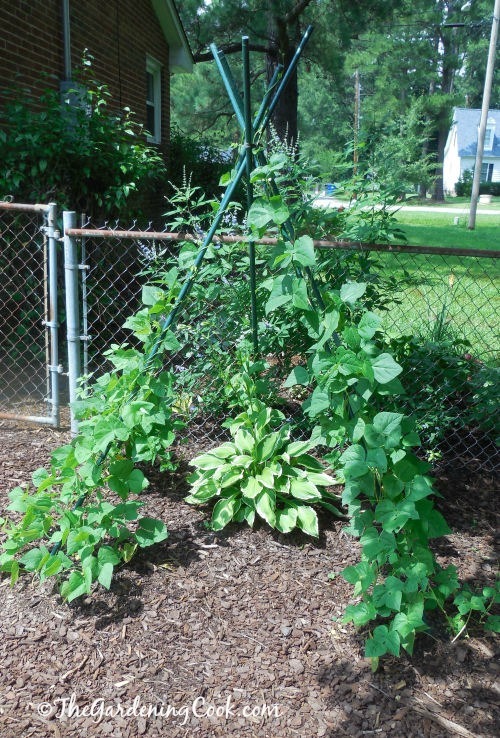 I came up with this idea for a bean teepee that not only allows my beans to climb beautifully but is easy to make and also makes a great garden accent. Oddly enough, this bean teepee is the most commonly “liked” part of my gardens by friends that wander through my beds. This teepee is simple to do, requires very little in the way of supplies and is very durable. I’m going to make a smaller one for my cucumbers to climb now. Assemble your poles and make sure they are all the same length. Mine were 8 feet long and about an inch thick and fairly solid plastic. Decide on the area where you would like your teepee to sit. 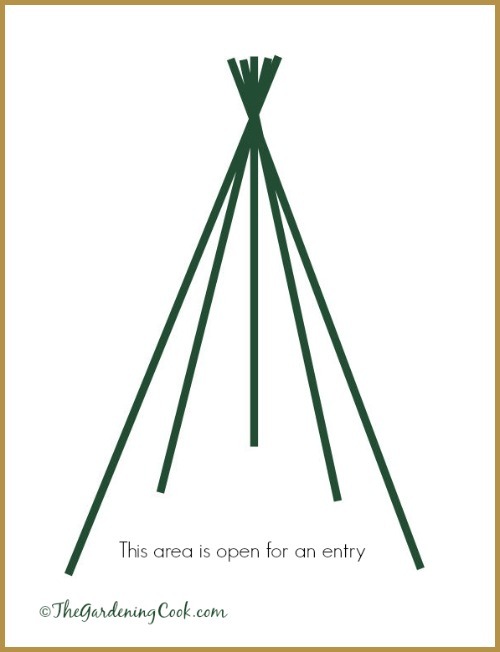 You will be making a structure that is similar in shape to a traditional teepee, with a large opening in the front. The opening allows kids to sit inside it, and a place to enter to pick the beans. The foot print of my teepee ended up being about 5 feet wide. Now comes the fun part. Grab your rubber mallet and pound the tomato poles into the ground at the five entry points. You will pound them into the ground at about a 45 degree angle. Don’t bother trying to support them at this stage. Just angle them and pound away. The photo below shows the angle of the poles near the ground when the teepee is upright. When you pound them in, they will be more angled. I didn’t have to stand on a ladder when I pounded the stakes in. I just used my height as the angle (about 5′ 9″). When all five stakes are pounded into the ground, grab their tips and just pull them all up to the height where you want them joined. There will be quite a bit of tension in the poles as you pull them upright. Take your elastic stocking and wrap it securely around the tips and tie in a few knots. 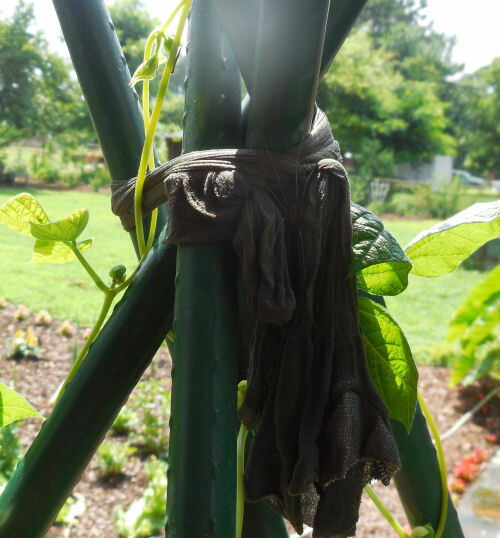 I stretched the elastic very tightly and it has not drooped at all, and has been in place with vines for several months. I put my knot at the back so the front of the teepee was not too unsightly. At the entry point for each of the poles, I planted my heirloom bean seeds in a circle. I placed about 12 seeds around each pole and just watered and allowed them to grow. As the plants grew, I had to take the tendrils of the plants and gently start them wrapping around the pole. Once they started, they just climbed beautifully. My last thing to do was to plant a large hosta in the back of the opening. This is not necessary, and not wanted if your children will sit in there, but since my baby is 24 years old, I did not think I’d have to worry about that part. I just wanted it to look well in my vegetable/perennial garden. 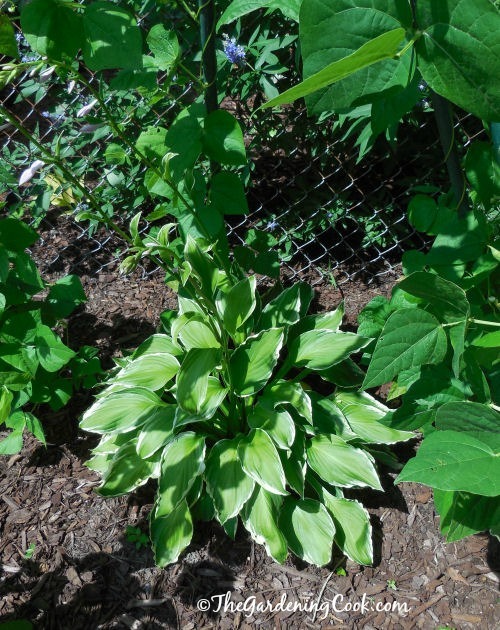 The bean teepee gives the shade that the hosta loves. What a beautiful structure this makes! This is the DIY bean teepee after two months of growth. Isn’t it great? And here it is from a side angle. I used five poles, but you could add more if you want the inside completely closed in. Imagine how the kids would love it and they could snack on healthy snacks while they play inside too! 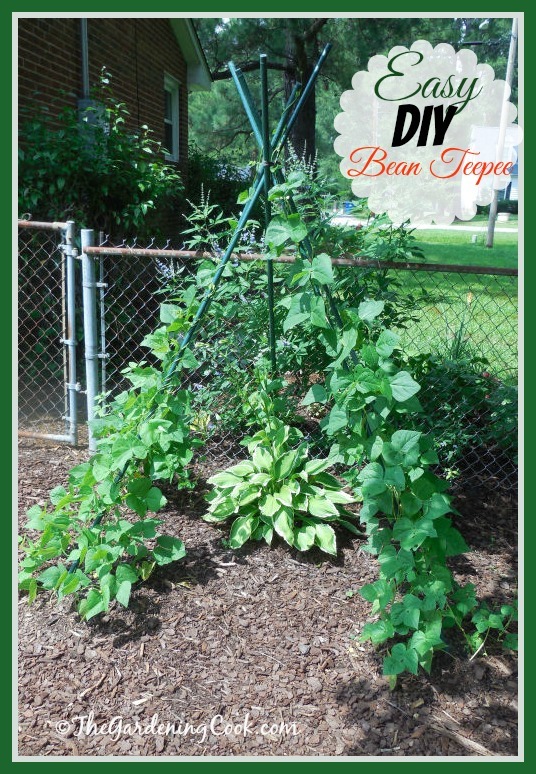 This DIY bean teepee was so much fun to do that I decided to make another one for the cucumber patch beside the beans. 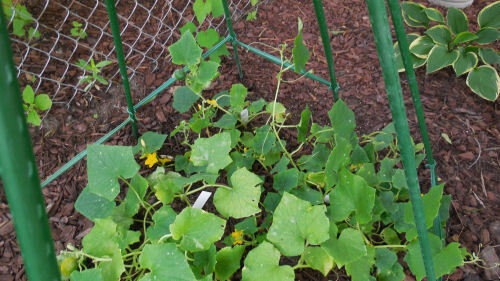 This time I used shorter 5 foot poles and attached some side braces to allow the cucumbers some support as they grow up the pole. This is such a cute scene in my garden. Almost like mama and baby teepees. One of the best things about this DIY bean teepee is how easy it is to do. I did not have any help when I did it, and it took me all of about 30 minutes from start to finish. I love it now that it is done and admire it every time I walk by it, as do all my friends! What do you use in your garden to help your climbing plants behave? Please share your projects in the comments section below. Disclosure of Material Connection: Some of the links in the post above are "affiliate links." This means if you click on the link and purchase the item, I will receive a small commission from the sale, but the price is the same for you. I am disclosing this in accordance with the Federal Trade Commission's 16 CFR, Part 255: "Guides Concerning the Use of Endorsements and Testimonials in Advertising." I use the exact same method but with bamboo poles. They are about 1 foot up the structure right now. I love watching them climb their way to the top! Looks great! Of course you get compliments! Could you do this with zucchini as well? Just a reminder to all. for the poles, almost anything that is straight & strong enough to hold up the plants, will do…I have seen some use 1/2 inch or 3/4 PVC, electrical conduit, bamboo, etc. Hi! I am Carol and I love to garden and cook (with a bit of DIY thrown in for fun.) I come from a long line of gardeners and have always loved to experiment with food and recipes. Join me as I cook and garden my way through life. The Gardening Cook is a participant in the Amazon Services LLC Associates Program, an affiliate advertising program designed to provide a means for sites to earn advertising fees by advertising and linking to amazon.com. I earn a small commission if you purchase through an affiliate link but the price is the same for you. © 2018 – Carol G Speake. All content on this site is ©Carol G Speake (The Gardening Cook) unless otherwise stated.